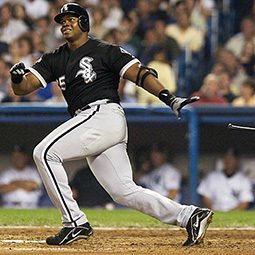 One of the superstars of baseball during the 1990s, Frank Thomas was the 21st player in the history of MLB to reach the 500-homer mark. He is one of the few players, apart from Babe Ruth, Mel Ott, Jimmie Foxx, Willie Mays, Ted Williams, Manny Ramirez, and Alex Rodrigues to score 500 homers as well as maintain a batting average of .300 or more over the course of his career. Thomas is also among the few players, apart from Barry Bonds, Ted Williams, Mickey Mantle, Mel Ott, and Babe Ruth who have scored 500 home runs during their career while accruing more than 1600 bases on balls. During 1993-1994, Thomas created history when he became the first MLB player to bag two Silver Slugger prizes each while playing at two separate positions (first base during 1993-1994 and as designated hitter in 1991 and 2000). Thomas was blessed with menacing power when it came to hitting home runs. His career was filled with enthusiasm as he entertained fans en route to breaking several records and creating a few of his own. He became the 11th ballplayer in MLB history to notch up MVP awards in succession. He was the first player from the American League to bag consecutive MVP awards since Roger Maris accomplished the feat in the early 1960s. When it comes to sacrifice flies during his career, Thomas had a stunning 120 flies, making him only the third player in history behind Hank Aaron and Eddie Murray to score more than 500 homers in addition to more than 100 flies. In the 1991 campaign, Thomas' 138 walks took the badge of the second highest in a single MLB season. Not only was it the highest number of walks accrued in that particular decade, but was also the highest by any player from the American League since Harmon Killebrew's record 145 walks in 1969. The 1994 season saw Thomas record a slugging percentage of .729 which is the highest seasonal record for a player from the American League since Ted Williams recorded .731 in 1957. Mark McGwire has been the only player to surpass Thomas' record when he averaged .730 during the 1996 season. 1994 was perhaps the best year in Thomas' career as he also recorded 0.494 in on-base percentage. It was the best showing since Ted Williams recorded 0.528 in 1957. When playing as a designated batter, Thomas revolutionized the game as he scored 269 home runs during his career and retired as the highest scoring designated hitter in history. However, his record was surpassed by David Ortiz, leaving him in the second spot on the all-time list. He is currently ranked 18th on the list of the highest homeruns, 22nd on the list of highest career RBIs, and 24th on the board for the highest career slugging percentage. Thomas engaged fans all over the country during his prime, so much so that the White Sox decided to retire his jersey number 35 when celebrating an on-field ceremony on the 29th of August – also called the Frank Thomas Day.